View of the parking area at Bien Hoa in early January 1966 showing two of the workhorses of the USAF during the early years of the Vietnam War: F-100 Super Sabres and A-1 Skyraiders. They made room for the Skoshi Tiger Project in a tightly-packed base. An F-5 loaded with 500lb Snakeyes (retarded) bombs and unfinned napalms. Taxying out at first light, an F-5 is carrying one of its favorite ordnance loads four 750lb GP bombs. Loaded with finned napalm and Mk.82 Snakeyes, an F-15 waits for its pilot to complete his briefing. 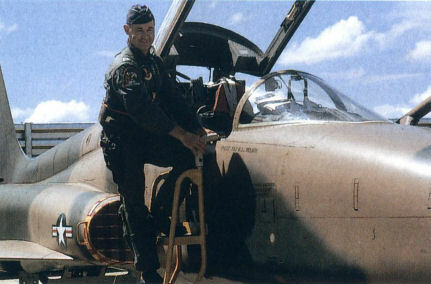 Colonel Frank Emory, 4503rd Squadron CO, climbs into the cockpit of his F-5 ready for another mission. Note the original 'Skoshi Tiger' emblem worn on his right shoulder. Captain Gill Dunne, a pilot in the 10th Air Commandos, suited up and ready to strap in for another mission over Laos. His F-5 is loaded with Mk.117 (750lb) bombs and BLU-18 napalm canisters. 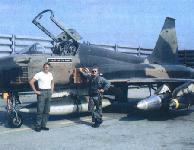 An F-5 loaded with 750lb GPs and a centerline fuel tank for an upcoming mission out of Bien Hoa. 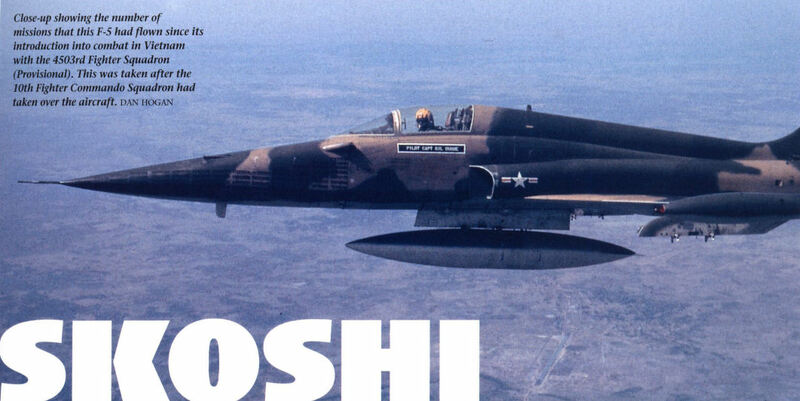 Armed with four 500lb Snakeyes, an F-5 is waiting for a forward air controller to call in a strike. This aircraft was an original 'Skpshi Tiger' bird, but was being flown by the 10th FCS at the time. Close-up showing the number of missions that this F-5 had flown since its introduction into combat in Vietnam with the 4503rd Fighter Squadron (Provisional). This was taken after the 10th Fighter Commando Squadron had taken over the aircraft. Two F-5s drop down to a lower altitude as they prepare to get in the landing pattern at Bien Hoa. Taken in early 1967 when the 10th Fighter Commandos were flying the F-5 in Vietnam. With the use of tankers the F-5 could penetrate deep into hostile areas with a maximum load of ordnance. 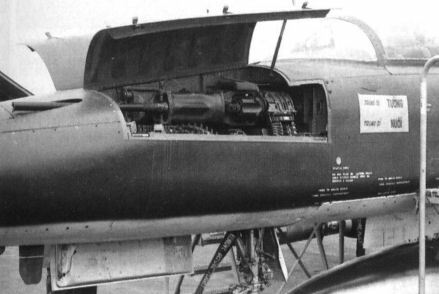 A F-5, loaded with four Mk.117 bombs, tops off its tanks before joining up with a forward air controller and selected targets. A rare group picture showing all of the original cadre of Skoshi Tiger pilots. Kneeling, second from the right is Col Frank Emory, commanding officer of the provisional squadron that took the F-5 into Vietnam. 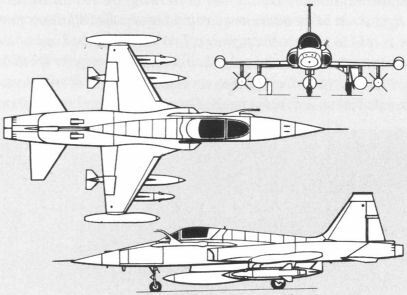 When the 10th Air Commando Squadron finished its tour in Vietnam, its F-5s were turned over to the South Vietnamese Air Force. A VNAF F-5 at Bien Hoa with its 20mm cannon bay open. 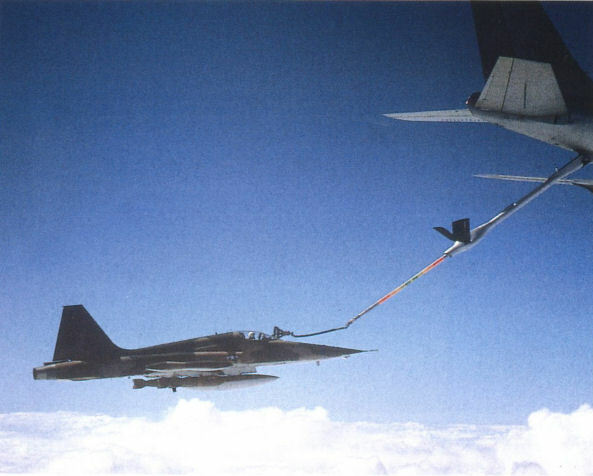 Northrop F-5A Freedom Fighter with in flight refuelling probe.